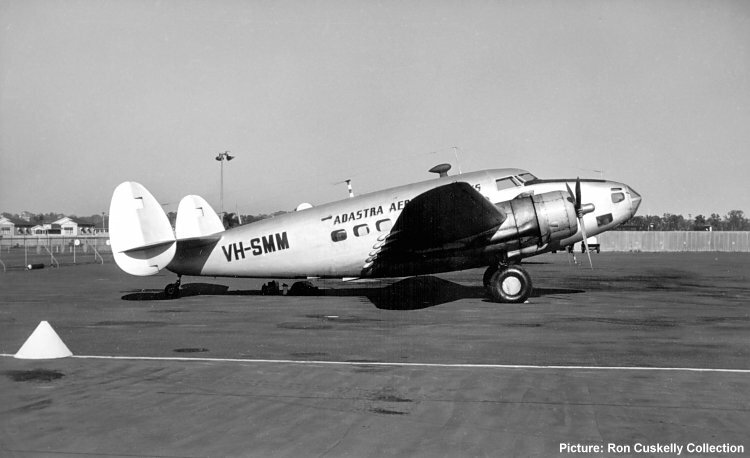 Hudson VH-SMM at Eagle Farm, Brisbane. The aircraft now has an additional "eyebrow" window on each side of the nose. Note the oxygen cylinder beside the fence at extreme left. This would have been used for topping up the aircraft oxygen system for high altitude photographic work. Its presence suggests that the aircraft was based in Brisbane for a particular contract. Note also the diagonal braces on the fence. These were added after the tour by the Beatles in 1964 when the crowds flattened the fence! This dates the photo as post 29 June 1964. The corrugated iron fence at the right of the image marks the eastern boundary of Doomben Racecourse.